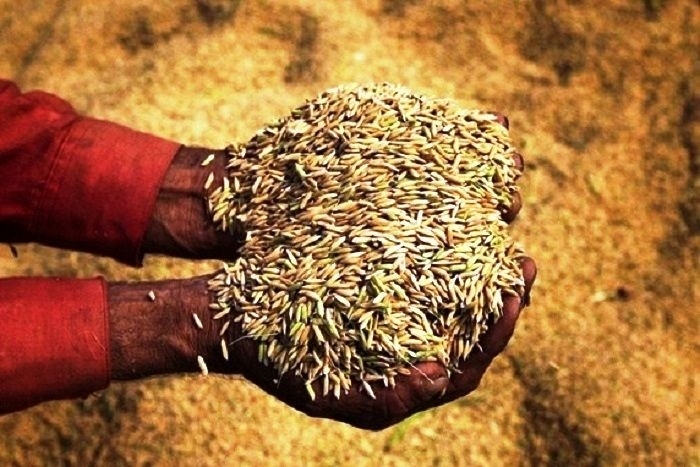 Why Are MP, Chhattisgarh Farmers Angry Despite High Production? Production of wheat in MP and paddy in Chhattisgarh has zoomed up in the last 15 years, yet farmers are increasingly discontented because of falling procurement. In the past decade and a half, Madhya Pradesh and Chhattisgarh have seen a green revolution of sorts. With widespread penetration of high-cost cultivation -- pumpsets for groundwater withdrawal, fertlisers and pesticides, high yielding seeds and mechanisation – output of wheat and paddy has shot up. 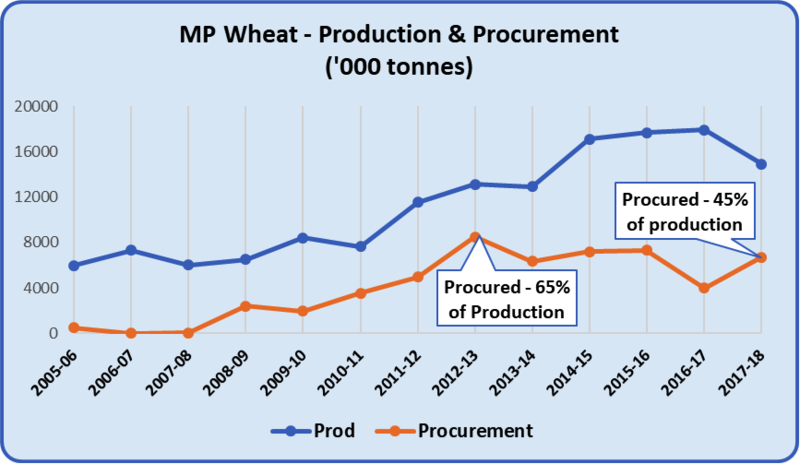 In MP, wheat production went up 150% from about six million tonnes in 2005-06 to nearly 15 million tonnes in 2017-18. 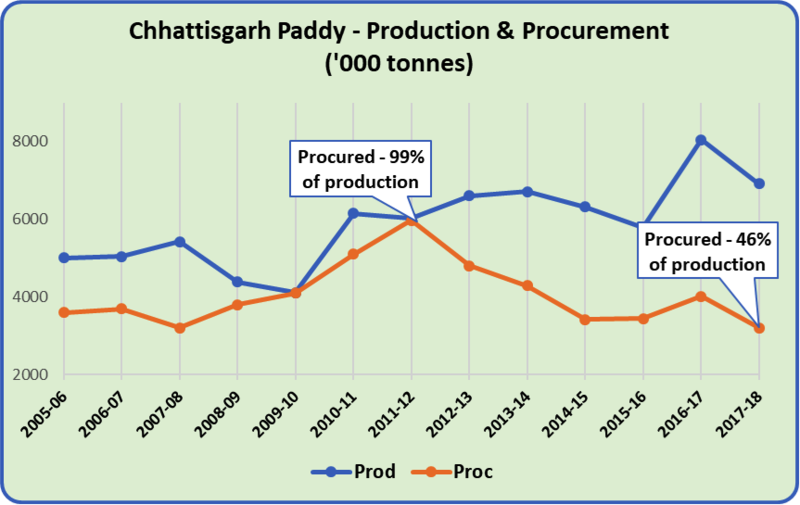 In Chhattisgarh, paddy production similarly increased by about 60% from about five million tonnes in 2005-06 to over eight million tonnes in 2016-17. Politically, this contributed to the Bharatiya Janata Party (BJP) winning three consecutive Assembly elections and forming governments in both states. Other factors, like the weakening of Congress and lack of any other viable alternative helped, but the farm boom was a big factor in this success. Now, the dream has turned sour. Farmers have been on the warpath for the past four years, starting with the Mandsaur (MP) police firing on agitating farmers. They have been demanding better returns since input costs have risen steeply while their returns in wholesale markets have not been sufficient. Minimum support prices were supposed to ensure some fair returns, but there is a hidden story here: since the last five to six years, and especially under the Narendra Modi regime, procurement programmes have floundered in both states. This means that more and more farmers are not selling to the government agencies, which are the only ones giving MSP (minimum support price) rates. In the open market, the prices are much lower. Less share of procurement means that fewer farmers are getting the MSP. So, their losses are mounting. Small wonder then that the past few years have seen repeated agitations by stricken farmers, and attempts by the BJP to console them with failed schemes, such as the Bhavantar Bhugtan Yojana (which aimed to pay the difference between selling price and MSP). Why this dropping off in procurement? A slew of funding cuts started being initiated by these governments in the period between 2011 and 2013, which meant that collection centres for procurement decreased or became defunct, bonuses were reduced. Coupled with easing of monitoring and political push the programme started losing steam. This directly meant that farmers were back to square one. Except that there were many more farmers, and much more produce at stake than say a decade earlier. In short, the once popular BJP governments in both states are now perceived as anti-farmer because it is in their watch that farmers are facing ruin. Although these governments were not really responsible for the earlier prosperity, they are definitely responsible for disrupting the system and causing distress to farmers. The forthcoming Assembly elections will show how much the tide has turned against the BJP because of its mistreatment of farmers.